Oinkari dancers at the Trailing of the Sheep Festival. This list will be updated as more event information becomes available. The 2016 Smithsonian Folklife Festival, which will be celebrating the Basque language and culture, is the top street festival in Washington, D.C. The festival will take place Wednesday, June 29, through Monday, July 4, and Thursday, July 7, through Sunday, July 10 at the National Mall, between Fourth and Seventh streets. Here are highlights of all the weeks’ events for you to pick and choose. Boise’s Oinkari Dancers will be performing on the National Mall’s Musika eta Danza Etxea stage on Saturday, July 2 at 11 a.m., and at 2 p.m. at the Frontoia, Sunday, July 3 at 11 a.m. at the Frontoia, and at 2:45 p.m. at the Musika eta Danza Etxea stage, Monday July 4 at 1:15 p.m. at the Musika eta Danza Etxea stage, and at 4:15 p.m. at the Frontoia. 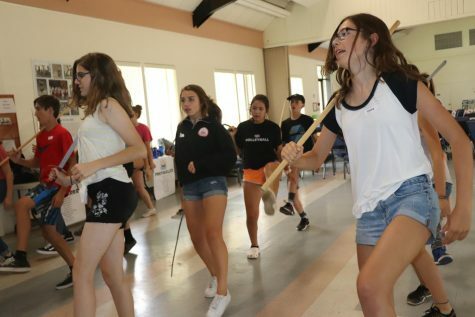 Chino’s Gauden Bat dancers will be performing on the National Mall’s Frontoia on Wednesday, June 29 at 2:45 p.m., and at 4:15 p.m. at the Musika eta Danza Etxea stage, Thursday, June 30 at 12:30 p.m. at the Musika eta Danza Etxea stage, and at 2:45 p.m. at the Frontoia, Friday, July 1 at 12:30 p.m. at the Frontoia, and at 2:45 p.m. at the Musika eta Danza Etxea stage, Saturday July 2 at 11:45 a.m. at the Txiki-Txoko Kids’ Corner, Sunday July 3 at 1:15 p.m. at the Txiki-Txoko Kids’ Corner, and at 4:15 p.m. at the Frontoia. Reno’s Zazpiak Bat dancers will be performing on the National Mall’s Frontoia on Thursday, July 7 at 4:15 p.m., Friday, July 8 at 11 a.m. at the Musika eta Danza Etxea stage, and at 2:45 p.m. at the Frontoia, and at 3:30 p.m. at the Txiki-Txoko Kids’ Corner, Saturday, July 9 at 12:30 p.m. at the Musika eta Danza Etxea stage, and at 2:45 p.m. at the Frontoia, Sunday, July 10 at 2 p.m. at the Frontoia. The Aukeran Dance Company will be hosting a dance workshop on the National Mall’s Musika eta Danza Etxea stage on Wednesday, June 29 at 2 p.m., and performing at 3:30 p.m. at the Frontoia, performingng on Thursday, June 30 at 11:45 a.m. at the Frontoia, and hosting a workshop at 2 p.m. and at 4:15 p.m. at the Musika eta Danza Etxea stage, hosting a workshop on Friday, July 1 at 11 a.m. at the Musika eta Danza Etxea stage, and performing at 1:15 p.m. at the Frontoia, performing on Saturday, July 2 at 12:30 p.m. at the Frontoia, hosting a workshop at 2 p.m. at the Musika eta Danza Etxea stage, and performing at 3:30 p.m. at the Txiki-Txoko Kids’ Corner, hosting a workshop on Sunday, July 3 at 1:15 p.m. at the Musika eta Danza Etxea stage, and performing at 4:15 p.m. at the Musika eta Danza Etxea stage, performing on Monday, July 4 at 11:45 a.m. at the Txiki-Txoko Kids’ Corner, and at 2 p.m. at the Frontoia. 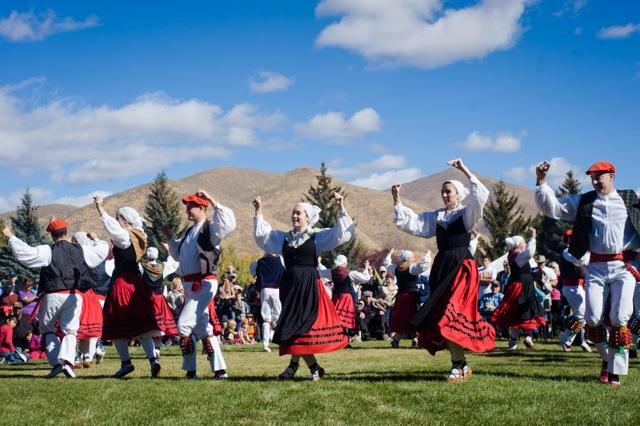 Nevada’s Basque Dancers of the Great Basin will be performing on the National Mall’s Musika eta Danza Etxea stage on Thursday, July 7 at 11 a.m., and at 2 p.m. at the Frontoia, Friday, July 8 at 12:30 p.m. at the Frontoia, and at 2 p.m. at the Musika eta Danza Etxea stage, Saturday, July 9 at 12:30 p.m. at the Frontoia, and at 2:45 p.m. at the Musika Eta Danza Etxea stage. The Dantzari Gazteak dancers will be performing on the National Mall’s Musika eta Danza Etxea stage on Thursday, July 7 at 12:30 p.m., and at 4:15 p.m. at the Txiki-Txoko Kids’ Corner, Friday, July 8 at 3:30 p.m. at the Musika eta Danza Etxea stage, Saturday, July 9 at 11:45 a.m. at the Txiki-Txoko Kids’ Corner, and at 2 p.m. a the Frontoia, and at 4:15 p.m. at the Musika eta Danza Etxea stage, Sunday, July 10 at 11:45 a.m. at the Musika eta Danza Etxea stage, and at 2 p.m. at the Txiki-Txoko Kids’ Corner. 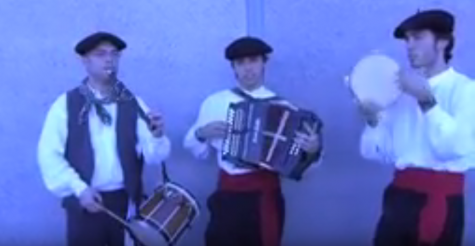 Kern County‘s Basque Club Dancers will be performing the following weekend, from July 7-11. The “Basque: Innovation by Culture” program will feature four evening concerts. All evening concerts are at 6:30 p.m. on the Ralph Rinzler Concert Stage. 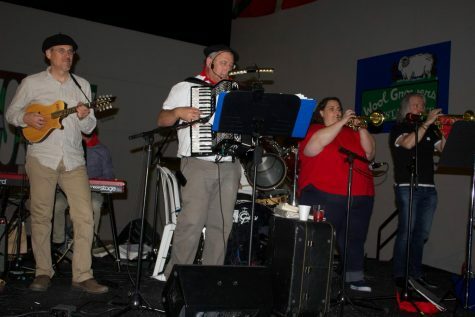 These concerts will take place on June 29, July 1, July 7, and July 8, featuring: Kepa Junkera and Sorginak, NOKA and Biotzetik Basque Choir, Korrontzi and Gatibu, and Kalakan with Aukeran and the Kern County Basque Club Klika. For more information on the evening concerts, check out our events page. NOKA will have additional concerts on July 1, 3, and 6 at the Smithsonian, the Kennedy Center of Performing Arts, and the Library of Congress. 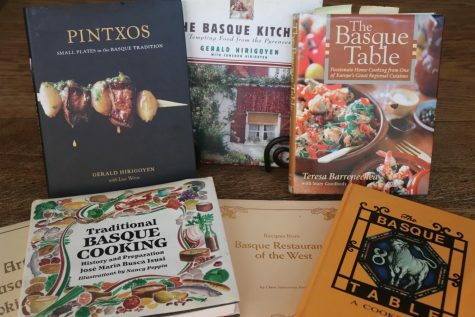 Food is an important element of Basque life. In the Ostatua Kitchen tent, chefs from two Basque culinary schools (Escuela Superior de Hostelería de Artxanda and Escuela Superior de Hostelería de Gamarra) will showcase regional cooking and drinks with cooking demonstrations and workshops. Chefs Igor Ozamiz Goiriena and Gorka Mota, culinary students Hasier Acebes and Rakel Rey, and other Basque artisans will teach visitors how to prepare iconic dishes, such as piperrada (pepper-based sauce) and marmitako (tuna and potato stew). 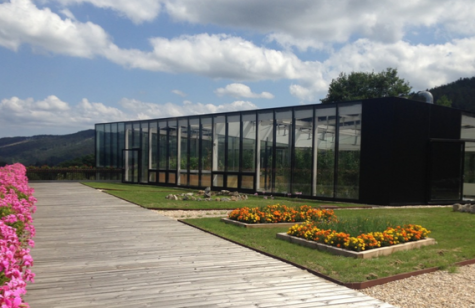 In the baserria (the farmstead), cheesemakers will share the art of producing the unique cheese of the Basque Country, and visitors will learn how people from a villager in Alava process salt from natural springs, using traditional methods to produce environmentally sustainable gourmet salt. The Festival will feature a small-scale salt flat, which Alberto Plata and Edorta Loma tend each day to exhibit the salt production process and provide seasoning for the Ostatua Kitchen cooking demonstrations. Visitors can try salt samples and buy Añana salt to take home from the Festival Marketplace. Felix Goiburu Errazquin, Maria Carmen Murua Jauregui, and their son Eneko Goiburu Murua will show the traditional cheese making process, using sheep milk from a farm in Maryland. On July 1, they will be joined by a sheep from the same farm. 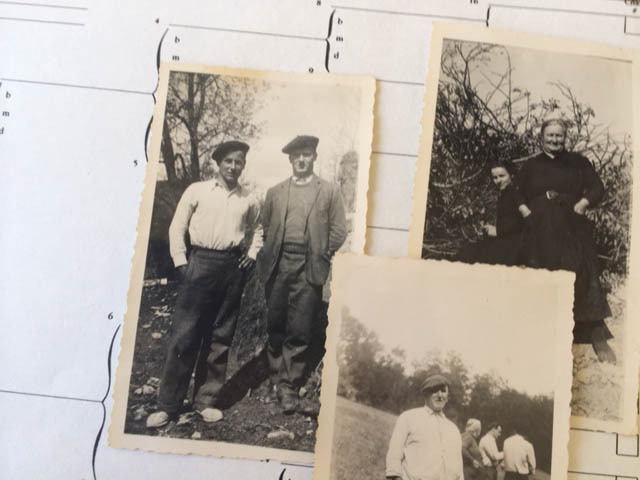 “The ‘Basque: Innovation by Culture’ program will show what determined language revitalization efforts can accomplish,” said Mary S. Linn, program co-curator. 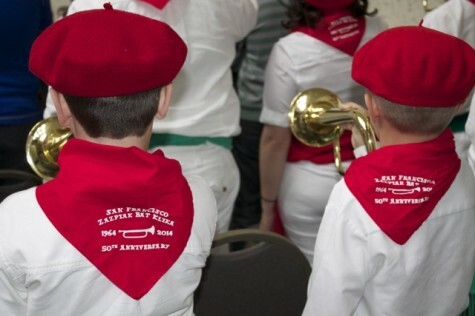 “The Basques took a language that was disappearing and through community activism and public-policy advocacy, have brought Euskara into the schools and into everyday usage. 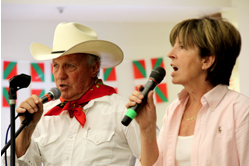 This accomplishment is reflective of the Basques’ culture of innovation.” Instructors Jose Francisco Zinkunegi and Erukine Olaziregi Gomez will lead daily Euskara lessons at the Euskaltegi tent. In the lantegia (the workshop), visitors will meet a master potter and teacher who is the only practioner of traditional Basque ceramic techniques. In the portua (the port), boat builders who use traditional methods will demonstrate their skills and build a 26-foot-long boat. 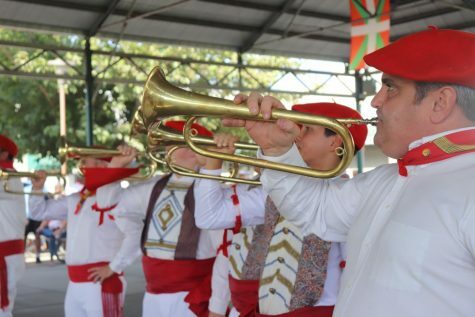 “Basque: Innovation by Culture” will also highlight the rich cultural expressions of Basque Americans, featuring dancers, musicians, shepherds, poets and more, who create Basque identity, community and traditions in the United States. There will also be bertsolaritza (oral poetry contests). Bertsolariak Irati Anda and Xabier Paya will demonstrate quick wits and clever lyrics in daily performances and share their skills with visitors in composition workshops. The Marine Industry: Albaola shipbuilders Mikel Leoz, Markos Sistiaga, and Ernesto Fernandez are coming to the United States with the skeleton of a twenty-six-foot txalupa, which they will rebuild on the National Mall to demonstrate traditional techniques. Maria Elena Garate Astralaga will show Festival visitors how she mends large fishing nets and also cook up traditional food in the Ostatua Kitchen tent. Engineer Miren Canellada and Jon Lasa will demonstrate the carbon fiber fabrication process and the pressure sensor system for each rower’s oar. Alongside a full forty-foot-long traineru, they will also build miniature prototypes. A centerpiece of the Festival is the frontoia. 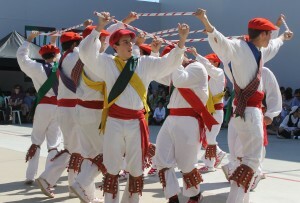 In Basque communities around the world, a frontoi is both a handball court and functions as the center of community life. As the symbolic center and meeting place for the American people, the National Mall is a fitting location for a frontoi in Washington, D.C. The Folklife Festival Frontoia venue will allow visitors to watch and participate in pilota (handball) and bolo (bowling) lessons and games, sokatira (tug-of-war), lokotz bilzea (corn cob racing), demonstrations of other bertoko kirolak (local Basque sports). Bakersfield dancers will dance at the festival. In the Folklife Festival Lantegia, master artisans from Basque county will demonstrate their skills in ironwork, stone carving, painting, and more. Ask questions, touch their materials, learn their stories, and find their products in the Festival Marketplace. The Marketplace will host special demonstrations and events, including artist signings, stone-carving demonstrations, pottery demonstrations and salt tastings.The Marketplace will be located, for the first time, inside the Smithsonian’s newly renovated Arts and Industries Building and will be open Wednesday, June 29, through Monday, July 4, and Thursday, July 7, through Sunday, July 10. Marketplace hours are 10 a.m. to 5:30 p.m. daily. Some Festival vendors will include: Sandrine Lasserre and Jean-Pierre Errecart, who will demonstrate the process of espadrille making and sell espadrilles for men, women, and children. César Alcoz, a traditional iron artisan, will be selling iron bookends, candleholders, and other decorative home items. Basque painter Jesus Maria Lazkano will be busy at the Festival painting two eighteen-by-seven-foot canvases. Head to the Marketplace for poster prints of his landscapes and seascapes. First generation potter Blanka Gomez de Segura and her daughter Itxaso Jayo Gomez de Segura will sell all sorts of handcrafted ceramic tableware, including plates, bowls, and mugs. Master stone carver Bernat Vidal will carve a traditional coat-of-arms design in a 550-pound stone from Basque country, using extra stone from the Smithsonian Castle, and sell small carved medallions in the Marketplace. Draftswoman Olga Uribe Salaberria will bring a loom to Washington, D.C., to demonstrate her weaving techniques. The Marketplace will carry Salaberria’s blankets, scarves, tablecloths, and more. 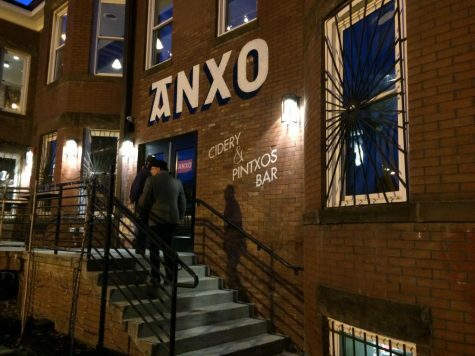 Anxo, 300 Florida Ave. NW. 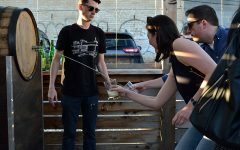 Cidery and Pintxos. Que pena que lo he leído tan tarde. Me encantaría participar en la fiesta. Soy nacido en Pamplona junto al portal de Zumalacarregui, en la calle del Carmen.